John our second mate plans and navigates the route to all our sites. 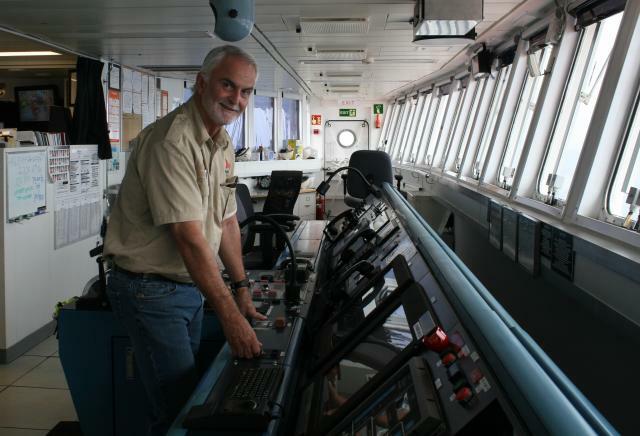 John has had a long and diverse career at sea. 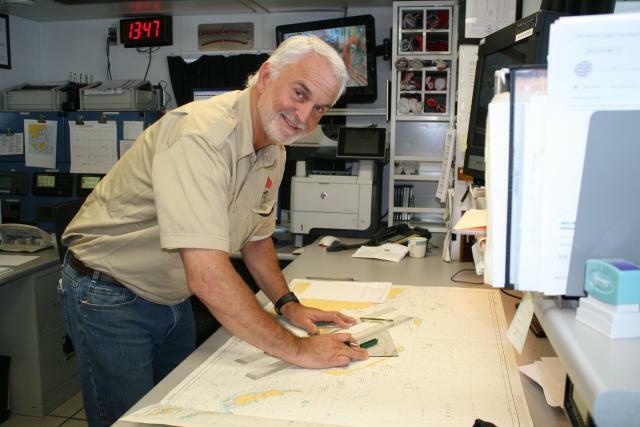 This is his last expedition on theJOIDES Resolution (JR) before a well deserved retirement. He has spent his working life afloat with 23 years on the JR and prior to that he worked on Research Vessel (RV) Vema, oil exploration vessels and supply boats. Tall_ship_(3838226062)RS Vemataken by RAF.He enjoyed school but left with no real idea what he would like to do and briefly contemplated joining the Royal Canadian Mounted Police. Luckily for us he went to sea whilst considering his options and has never looked back. To gain his first position he wrote to the captain of the RV Vema and was offered a job. This boat, now famous, was one of the first ocean going research vessels covering one and a quarter million nautical miles during its life as a research vessel. 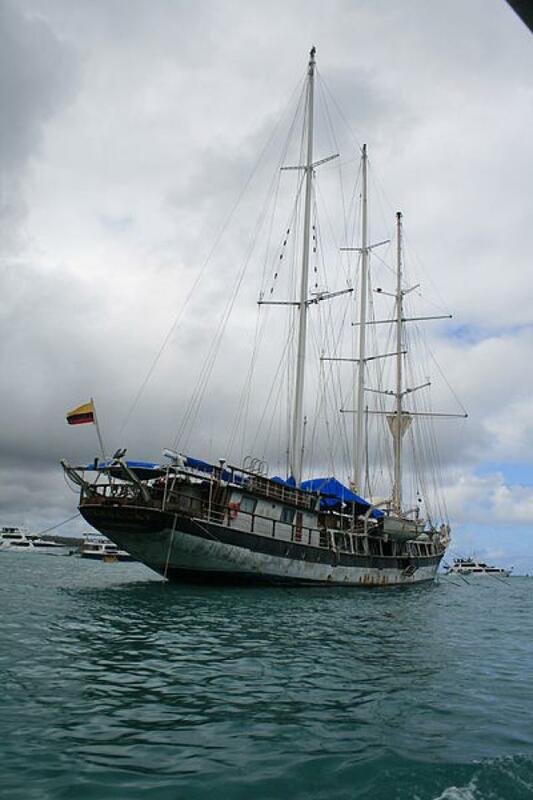 Originally a schooner it had its masts lowered and a huge engine fitted during this time. The RV Vema took seawater and sea floor samples wherever it was twice a day, and in doing so contributed hugely to our knowledge of the oceans and Earth processes. It was key to the confirmation of sea floor spreading, and greatly increased the number of deep-sea core samples then available for research. Today the Vemahas been refitted, renamed and returned to its former glory as a sailing yacht offering upmarket holidays in the Caribbean. John’s first trip departed from Acapulco in 1975 where he witnessed the impressive cliff diving. It was a truly world wide trip and opened his eyes to different cultures and ways of life. He was to see Hawaii, Colombo, Japan and Russia before he returned to Canada a very different person to the boy who had left some 12 months previously. The RV Vema rolled in heavy seas, making working on the deck hazardous. John was lucky to be part of a reliable team as he would have been washed off the deck had it not been for the quick thinking of a Fijian colleague grabbing him as water washed over the deck in a particularly heavy sea. He worked on a series of vessels over the next few years working on supply boats for oil rigs and journeying to the arctic with oil exploration vessels. It was on one of these supply boats delivering goods to oil rigs when he was almost washed into a heavy sea for the second time. Icy water from a wave breaking over the stern washed him up the deck as the boat reversed up to the oil rig. Luckily he managed to cling on – but he sustained permanent damage in one hand. He was very happy to join the JOIDES resolution in 1994. He has never been that fond of flying, so he preferred the work pattern of two months on two months off which required fewer air trips than his previous schedules. Once on board he was delighted to find that the boat was very much more stable and quiet to work on than those he had become used to. He also found the time off could be more usefully enjoyed. Ships like the JOIDES Resolution have structured roles given to those working on board. Whilst the Captain has overall command of and responsibility for all those on the ship, he is assisted by three mates. The chief mate is in charge of deck work and maintenance. He keeps the boat well painted, and is responsible for the cranes and the stability of the ship. As second mate John’s role is to put together a comprehensive passage plan. This requires him to research the areas where the scientists want to drill and evaluate the routes to take them there. He needs to not only find out about tides, currents and prevalent weather, but the political environment in the area, the risk of piracy and if there are any other risks to the operation. For example he once discovered an area that was to be drilled had been a place where unwanted ammunition had been dumped. John has many happy memories from his years at sea. These include an unforgettable trip to the Antarctic. He clearly remembers the enormous icebergs much bigger than any had seen in the Arctic years earlier. Miles long and a beautiful turquoise blue he enjoyed watching the penguins standing along the tops of them. It was with amusement her realized that as much as those on board were studying the penguins, the penguins were gathered at the edge of the iceberg to watch them. Extra precautions are taken in such an environment with an ice observer nominated to ensuring the monitoring of icebergs in the vicinity at all times. If it is thought that one is likely to collide with the ship whilst drilling is underway the drill floor is notified. The drill is dismantled and lifted sufficiently to allow the ship to move and the iceberg to pass. John is looking forward to his retirement, but it is unlikely he will be off the water for long. He and his wife Susan are looking forward to spending time on their yacht sailing. 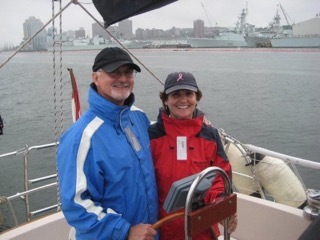 John is lucky as his wife also enjoys being on the water and has taken courses in navigation. He is considering volunteering to navigate on a Mercy Ship. These ships are floating hospitals that are taken to countries with a medical need. John and Susan have two daughters and three grandchildren, all of whom he is clearly very proud. He is looking forward to having more time with his family. He and Susan are also considering spending some time in Ecuador. We wish John all the very best for a long and happy retirement and thank him for his years of service on theJOIDES Resolution and for his substantial contribution to our global understanding of Earth systems.